Great strides have been made in the value of women in business, but there is still much work to be done. Have you noticed that after a presentation, men ask all of the questions? Have you ever offered a recommendation at a meeting and been ignored? Do you start your conversation with "I may be wrong but�." Women are sometimes our own worst enemy. Too often we underplay our strengths, skills - and yes, our value. Betsy will teach strategies to gain power, to get recognition, and to get what you want. The interactive presentation will cover strengths, work/life balance, negotiation, and communication. E. L. "Betsy" Smith works with executive and professional women who are unafraid to leave their mark and build their legacy. A certified leadership coach and the owner of E. L. Smith Consulting, Betsy serves on the board of the Raleigh Chapter of the International Coach Federation, on the board of the RTP Femfessionals, a women's professional organization, and is a Mentor with the RTP Healthcare Business Women's Association. In June 2012, Betsy was recognized by the Triangle Business Journal as the Business Woman of the Year in the Mentor category. Betsy has an undergraduate degree from the University of Texas and Master's Degree and PhD from Texas A&M University where she was recognized as one of Thirty Distinguished Graduates from the College of Education. She is a graduate of Leadership Pensacola (FL), Leadership Florida and the Cornell Executive Leadership Institute. Betsy has been one of the first women to serve as Dean, Provost and Associate Vice President at Pensacola State College in Florida. She was one of the first women to join a Rotary Club, and subsequently was a founding member and president of another club. Betsy co-authored Second Blooming for Women: Growing a Life that Matters After Fifty with Kathleen V. Logan. Betsy and her husband Jack Parkin live in Cary, NC. (* Hors D'Oeuvres and soft drinks included in registration fee ). 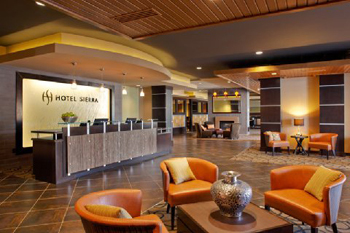 When searching for HYATT House Raleigh Durham Airport on your GPS device, please reference Hotel Sierra Raleigh Durham Airport to obtain accurate directions. HYATT House Raleigh Durham Airport is located approximately 5 miles from the RDU International Airport. Take Exit 283A - Highway 540 West - Triangle Expressway. Once on 540, Take Exit 69 - Cary/Chapel Hill - Highway 54. At the end of the exit ramp, turn left (East) on Chapel Hill Road - Highway 54 toward Cary. At the 2nd traffic light, turn left onto Carrington Mill Blvd. Hotel is on the right. Take Exit 283 - Highway 540 West. Once on 540, Take Exit 69 - Cary/Chapel Hill - Highway 54. At the end of the exit ramp, turn left (East) on Chapel Hill Road - Highway 54 toward Cary. At the 2nd traffic light, turn left onto Carrington Mill Blvd. Hotel is on the right. Take exit 69 for Cary/Chapel Hill - Hwy 54, Morrisville. At the end of the exit ramp, turn left (East) on Chapel Hill Road - Highway 54 toward Cary. At the 2nd traffic light, turn left onto Carrington Mill Blvd. Hotel is on the right.